The Joint Commission Working Group on Under-represented Groups in Surveying organized a workshop during the FIG Working Week in Athens this year in May, which was well attended. Three presentations were given from Ali Buxton and Pat Turell (United Kingdom), Gabriele Dasse (Germany) and Eleni Tziortzioti (Greece). 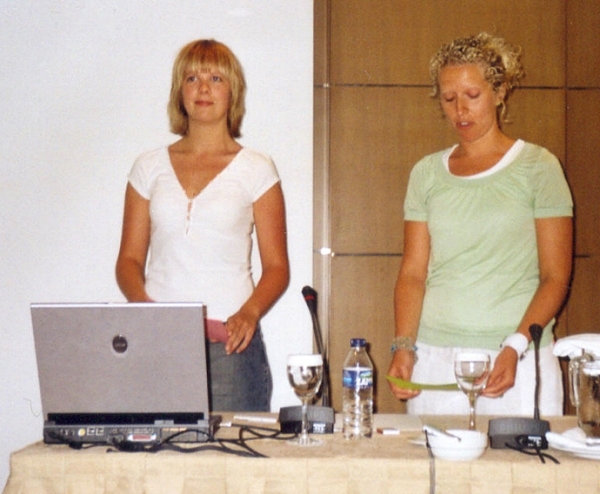 Unfortunately Sara Wilkinson (United Kingdom) and Anna Karagiannaki (Greece) could not attend the workshop. Started with these presentations the workshop produced an interesting debate and discussion. Many thanks for the presentations, to Boo Lilje as rapporteur and to the participants for their questions and statements. During the afternoon session concerning young surveyors, Linnéa Lindqvist and Jennie Nilsson presented their paper. Summaries of the papers will be published in this issue and the next one. Meetings with FIG President Holger Magel and Vice-President Bettina Petzold during the working Week resulted in deliberations to draw up FIG guidelines to improve the situation of women, young surveyors, like students, and cultural and language minorities. A draft should be presented and discussed during the Working Week 2005 in Cairo. The purpose with this article is to challenge FIG to work harder with the question how to involve more students in the organization. We will handle the topic in this article from a student perspective; what could be done and how should the proposal be implemented? Last year we attended the FIG working week in Paris. During the conference we joined a session about underrepresented groups in FIG, held by Gabriele Dasse. During the session we discussed the problem that there are few female surveyors, few students and few surveyors from distant countries who are participating in these global meetings. We talked a lot about the lack of representatives of the surveyors of the next generation; more students should participate during these conferences. This is a topic that has been discussed in FIG for several years, but no solution is yet to come. Without active participation of the next generation there is no future for any profession connected to the organization. It was during the discussion with Gabriele Dasse, since we are students, the question came into our minds; how can we get more students involved in FIG? FIG represents an important international perspective of the Survey profession. It is important for students to get a connection to the organization and this international point of view in an early stage of the studies. A connection to FIG brings a possibility for the student to get an international commitment, a chance to meet people of the same age in the same situation and a chance to meet experienced colleagues. A gathering of students connected to FIG would be the beginning for the next generation of Surveyors to get a social network with personal contacts. It will also bring a chance to meet new friends and future fellow workers. Another aspect of the meetings between students from different countries is the possibility with exchange studies. It is easier to establish a contact with a University abroad if you already have a personal contact there. The experience of exchange studies brings personal development and understanding for different cultures, which are important in the forthcoming work as a surveyor. Therefore, FIG should work to promote international co-operation also for the students. Moreover, to let survey-students join the working week is a stimulant to FIG and brings important rejuvenation to the organization. Active participation of the next generation in FIG is very important for the future for all professions connected to the organization. Students involved in FIG do not meet all the needs of today, but they will meet and develop the challenges of tomorrow. Students seldom have the possibility to finance the participation in the Working Weeks. Some kind of sponsoring is necessary for the students to be able to join the gatherings. One way to make this happen is if FIG supplies students with Scholarships. However, FIG already has student discounts on the membership fee and Scholarships for surveyors from distant countries. A more reasonable possibility is if member-organisations of FIG could sponsor students from the specific country. It is in their interest that a Surveyor of the future has a width in her approach to the forthcoming profession. Another way for students to take part in FIG is to get the Universities interested. The Universities could arrange suitable contests to find interested students, and sponsor their participation at the working week. To sponsor a student is a great chance for both the University and for the specific student. The student becomes an ambassador for the University, which leads to great advertisement. To get the attention from the universities, a well organized co-operation between the specific University and a contact connected to FIG has to be established. The responsibility for the co-operation should be in the hands of FIG and our proposal is to create a sub-group. This sub-group could be a part of commission 2 - Professional Education. It is important with a well organized forum to maintain the regularity in the work with establishing students in FIG since you are a student in a limited time. The sub-group could be the link between FIG and the worldwide students. Another way of helping students to be part of FIG is if experienced members stand by students and become some kind of mentor. This mentorship would lead to pleasure for both the mentor and the student since they both can inspire each other. The student will come with new ideas from an educational perspective while the Surveyor inspires the student with knowledge and experience. The mentor and the student could have their contact during the year via e-mail for example and then meet in the Working Week. It is a possibility for all local Survey students when a Working Week takes place in their home country. Many more students have the chance to participate as it does not demand as much funds to get to the conference when it is nearby. FIG could help those students with the experience and pleasure that rely in task of welcoming foreign students. At the working week there can be a smaller session where the students have an opportunity to talk about their experiences, differences between their educations and the possibilities to exchange studies. These discussions may serve as the basis of a further discussion in the home country of the student. In our future profession as surveyors it is important to have international contacts as the countries of the world works differently. There is much knowledge in different areas that can be shared if international contacts are established on an educational level. Today there is a lack of students involved in FIG, which prevents new ideas from young people. A sub-group for students in FIG and a co-operation between FIG and Survey Programs all over the world would give many young people the great experience that participation at a Working Week gives. A student organization could be the beginning of a social network with personal contacts and a chance to meet new friends and colleagues from all over the world for both students and veterans. Greece is one of the countries that the majority of the students in surveying field is still male, the same as it is at the professional level. Last years, the statistic numbers prove that something happened which gave very good reason to female candidates to choose that field of studies. There were no activities by governmental or non-governmental organizations that they tried to encourage in this direction. Changes became by themselves, as the definition of surveyor engineer for the Greek inhabitants seems to be more attractive as he is the engineer who uses mostly new technologies and also has very low percentage of unemployed. It is also very common to meet Greek women surveyors that they are very successful professionals. In Greece there is a big number of university-educated citizens in proportion to the population. Surveyors are not an exception, so the total number of surveyors till the end of 2003 was 5,863, the 4,373 of them are men and the 1,490 are women. The first lady obtained her diploma in 1959, means she entered to the polytechnic university in 1955. The past years, beginning in 1959, divided in decades, and studied the improvement of the female numbers, through the numbers of qualified surveyors. In the first decade the percentage number of female graduates was about 7.94 % and in the second decade this increased in 12.03 %. The first women surveyors had to face out with a really hard profession, which included field works with heavy geodetic instruments, and movements in hard conditions. They also had to take care by themselves the guarding of their children due to the non-existed social care in this field. As the family bonds were very constant, it was possible to count on them. The difficulties guided most of them who graduated till the end of seventies to follow a carrier in Public Sector. 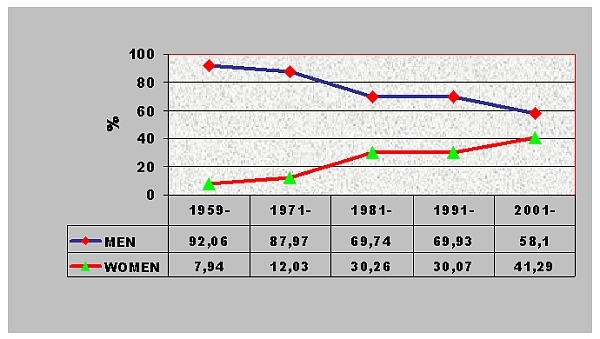 As it is seen at the following figure, there is a big gap at the decade of eighties, as females suddenly approached the 30%. It is very important to mention that from the second part of the seventies, much more women than usually began to study and especially concentrating to non-traditionally female fields, as it happened with surveying science. In the beginning of the next decade (eighties), it is the informatics’ revolution that changes the rules, and surveyors were the first engineers that involved with computers’ use. They began use them in their diary activities, and done the calculations faster and easier. New technologies changed the rules in photogrammetry, introduced the digital photogrammetry, the remote sensing methods, the GIL/LIS, and of course the management of all these masses of data. Even the geodetic instruments became modern, faster and less heavy than in the past (total stations, GPS). The two technical universities followed the changes and they offered to the students (in time) all the necessary education to be “modern engineers”, in the beginning of the 21st century. So year-to-year the profile of the Greek Surveyor changed and also changed the market demands and the necessary skills. The last decade (nineties) is marked with the beginning of the implementation of the Hellenic Cadastre, which based in a lot of new kind of works for the Greek market, and in use of the most modern techniques. It is noticed that the majority of the surveyors having a responsible position, in sub-projects were young women, well educated and with special female skills, necessary for all those complicated works. A surveyor now has to spend more time for processing and manage data than product data in the fieldwork. Traditionally, in the same time that men were at the field works, women were in the office and in support works. In the past this was a disadvantage, but women working at the office had the sense to understand immediately all the advantages that new technologies were given. They also became the “mothers spirit” of the companies and they developed their managerial abilities. It is proved that they had a special skill to combine the cadastral data (topographic data, legal issues, special local conditions, communication with citizens and authorities, develop solutions etc). As the most women involved with new technologies to give better opportunities to their professional position, the new technologies have accepted faster from the surveyor professionals. This was a two-way development between females and profession. It seems that surveyor engineers lead now in this field in Greece and this is something that can’t be changed. Many ladies are now very successful professionals (owners of companies, managers, academics, directors etc. ), and this creates an attractive image of the female surveyor that encourages more and more young girls to choose this field of studies. Total adaptation of new technologies at the universities’ plans, although in Greece studies in technical universities are already very good. Amelioration of the social supply for the woman who works. Concluding we talk about a modern profession that can be a “two genders profession”, with a lot of opportunities and that offers the necessary flexibility to follow the new incomes, in a world that walks with big steps. Prof. Ewa Krzywicka-Blum, Chair of the ICA (International Cartographic Association) Gender and Cartography Commission would like to enlarge the collaboration between the Gender and Cartography Commission and the Working Group on Under-represented Groups in Surveying. The proposal is, to exchange basic information concerning actually realized projects, workshops and meetings. 1. During last four years a Socio-Demographic Atlas of Poland illustrating chosen problems of under-represented subpopulations (minorities, single mothers) and users with special cartographic needs (the blind, emigrants, pupils, sportsmen) was prepared. Some pages of the Atlas are accessible on http://www.geo.ar.wroc.pl/GC/atlas/ica_atlas.html. The ICA Gender and Cartography Commission wants to promote the production of gender issues oriented atlases of various regions of the world by encouraging various institutions and organizations to prepare atlases similar to the Polish Atlas. Is it possible to include such an initiative to the activity of FIG? 2. For 2003-2007 the ICA Gender and Cartography Commission wants to prepare guidelines and specifications for mapping of issues related to gender and under-represented groups at regional and global levels. Is it possible to cooperate in this field? I am looking forward to getting your remarks and some new ideas. For more information about the Gender and Cartography Commission visit the website http://www.geo.ar.wroc.pl/GC/. For the ICA Gender and Cartography Commission it is interesting to enlarge the list of Women in Cartography to Women in Cartography, Geography and Geodesy. ABET is an accreditation organization based in the United States. Until recently, it was known as the Accreditation Board for Engineering and Technology. ABET provides an internationally recognized mechanism through which a number of associate-level and baccalaureate-level surveying programs are evaluated in the United States. Programs may apply to ABET for accreditation, at which time the review process begins. Evaluation may take place over the next one to two years, and accreditation periods may extend up to six years. 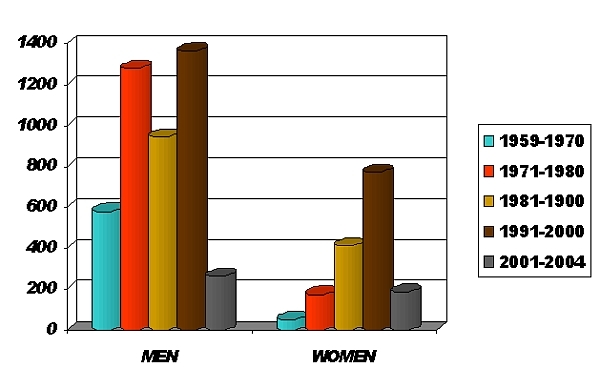 The issue of diversity in education will be a topic of four sessions at the October, 2004 annual meeting of ABET. “The changing face of the United States workforce, the evolving international practices of employers, and the shifting of technology and jobs around the world, are all matters of increasing concern stemming from the globalization of the economy,” ABET said. “While globalization in many ways continues to benefit our fields, it has created challenges as well,” ABET continued. In one of the sessions, industry leaders will discuss the knowledge, skills, and attitudes they seek in their employees, talents that allow employers to retain their competitive edge in the marketplace. Therefore, another upcoming session at the annual ABET meeting will include specific issues such as changes in pedagogy, the retention of diverse student populations, and creative initiatives for diverse learners. Diversity is also an issue among professional associations. “Many of the technical and professional societies in the ABET disciplines are struggling to increase membership and to retain their current members,” ABET explained. “For many societies, the top concern is not simply a matter of retaining and increasing membership, but rather of diversifying membership to reflect the global workforce. “Among ABET societies, diversifying at the leadership levels is a top concern, as is supplying ABET with a diverse pool of program evaluators, commissioners, and Board members.” In one of the upcoming sessions, society representatives will discuss challenges they face, and the best practices they have found so far. As an accreditor, ABET has at least three options to be discussed. (1) ABET could indirectly support a program’s endeavors toward diversity enhancement. (2) ABET could create a set of recommended guidelines for programs to follow. (3) ABET could add accreditation criteria to address diversity directly. Gathering input on these three options will be a goal of the October discussions. Other accreditation bodies will also be involved. Detailed session descriptions are available at www.abet.org/annual_meeting_cover.html. The April, 2004 issue of Physic Today reported that Elizabeth Ann Johnson, a contributor to several branches of theoretical physics and an advocate for women in science and engineering, died at her home in Guildford, England at age 67 last September after battling cancer for several years. A tribute to Johnson was written for PHYSICS TODAY by Angus MacKinnon and John Pendry of Imperial College London. Johnson was born in Philadelphia, Pennsylvania. She received a BA in physics and mathematics from Swarthmore College in 1958 and then travelled to the UK as a Fullbright fellow, where she pursued research at the University of Manchester. She completed her PhD there in 1961. Her thesis concerned symmetry classification of the elementary particles. Her husband Ron is a professor of theoretical physics at the University of Surrey, also in the UK. Johnson conducted further research at Manchester as well as at the University of Pittsburgh and the University of Wisconsin-Madison. 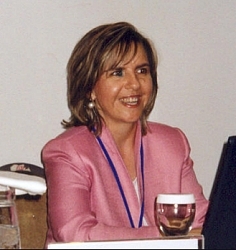 Over the years, she held positions at King’s College, the University of Auckland, and the University of Surrey. 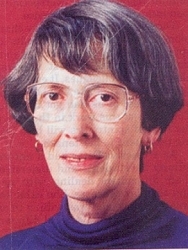 She was one of the first to obtain a fellowship from a fund set up by Daphne Jackson in 1986, who was then the only female professor of physics in the UK. The thrust of Jackson’s program was to enable women who had taken a break from their science or engineering careers to resume their research. Johnson was deeply committed to Jackson’s ideals. When Daphne Jackson died, Elizabeth Johnson became a part-time coordinator of the program. Johnson divided her time between her physics research and the Daphne Jackson Memorial Fellowships Trust. “Johnson was also instrumental in setting up Portia, a Web site that provides a gateway for women into science, engineering, and technology,” said MacKinnon and Pendry. Johnson also created the Daphnet mailing list for women in those fields.